Michelle Obama has been trying so hard to outshine First Lady Melania Trump. Last week, Michelle got mostly bad reviews when she showed up on her book tour wearing glittery $4,000 dollar thigh-high boots. Right away, people compared the outfit to Melania’s gorgeous white sequin Christmas gown. Now, Michelle must be really fuming. The first lady was just caught doing an extremely brave act. It was so brave that it will go down in history. You’ll love this. The Democrats and their cohorts in the mainstream media were freaking out late yesterday afternoon when reports came out that President Donald Trump and First Lady Melania Trump had secretly flown all Christmas night to visit the troops in Iraq. “After a secret overnight flight from Washington, the President and Melania Trump touched down onto a darkened airstrip at Al Asad Air Base west of Baghdad, the dicey security situation still restricting Trump to a clandestine visit more than 15 years after the American invasion,” CNN begrudgingly reported. Immediately, the leftist media who have been relishing the fact Trump had not yet visited a combat zone, looked for any angle to trash the president, missing the real story. The Washington Post missed what will go down in the history books, too. Instead, they decided to focus on social media users attempting to track Air Force One. “The trip, which comes the day after Christmas, was not previously announced by the White House. But it was marked by several clues suggesting that Trump was headed overseas, prompting alarm from some quarters over the apparent lack of operational security,” The Washington Post reported. Yet, the leftist Trump-hating media refuses to report how the first lady just made history on this holiday trip to visit the troops. There are only three other first ladies who have ever traveled to a dangerous combat zone — if you count Hillary Clinton’s debacle in Bosnia. We’ll include Hillary for argument sake. The two others are Pat Nixon who went to Vietnam in 1969, and Laura Bush who traveled to a combat zone in Afghanistan in 2008. Now, we can include First Lady Melania Trump who bravely traveled into the Iraqi combat zone, making history. Hey, she didn’t have to go. No one would have said a thing, especially since Michelle Obama never traveled to a combat hot-spot. Out of 53 first ladies of the United States, Melania becomes the 4th ever to risk her life going into an active military zone. This is another reason why this trip was so top secret. If enemies of the U.S. in the region found out, Air Force One and the entire trip would be a huge target. Even President Trump had fears for Melania’s safety. “The president marveled at the amount of security it took to get on base, despite spending trillions in the Middle East to make it safer,” Breitbart reported. “Pretty sad when you spend 7 trillion dollars in the Middle East and going in has to be under this massive cover with planes all over and all of the greatest equipment in the world and you do everything to get in safely,” Trump said. Can you imagine if Michelle Obama traveled to a dangerous military zone, and she was only one of three other first ladies to ever do so? The leftist media would be going nuts, but not a mention of Melania Trump’s brave act has shown up in any of their headlines. That’s why patriotic Americans need to spread the word. 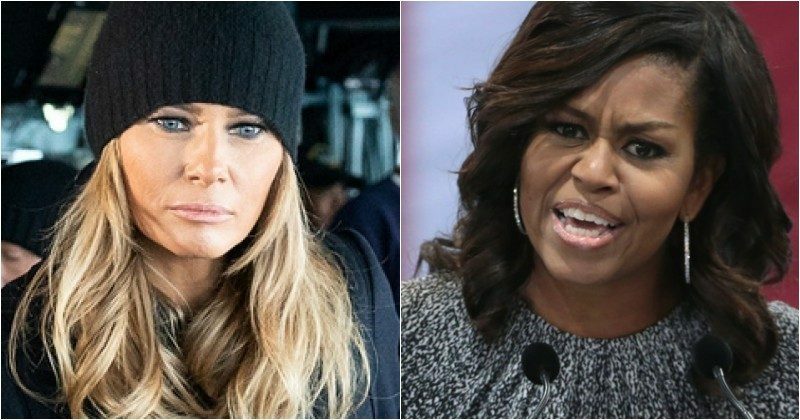 The first lady is beat-up on a daily basis by the Trump-haters. Now, she is going down in the history books for her bravery. She was putting our troops before her own needs, leaving Christmas night to fly on a dangerous trip, and bringing joy to those who spent Christmas so far away from loved ones. We, the American people appreciate our first lady, and we won’t forget all she has done to make America great, again.